The numbers are published and the cat’s out of the bag! 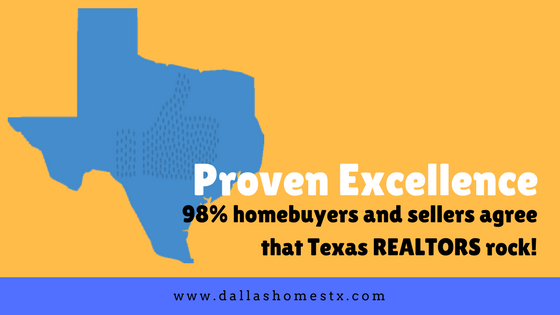 According to the TEXAS REALTOR® SATISFACTION INDEX (2017 EDITION),Texas homebuyers and sellers gave Texas REALTORS a huge thumbs up, with an overall satisfaction rating of 98% (4.91 out of 5) when working with a Texas REALTOR®. Not bad, eh? Working with a REALTOR can not only save you time and money, but can also make your home buying or selling experience go a lot smoother; especially if your REALTOR is experienced and well educated in the market.